Announcement Funky, retro, goth, primitive, whimsical, spring, halloween, christmas, custom, collectible, clay, cloth, OOAK art dolls. 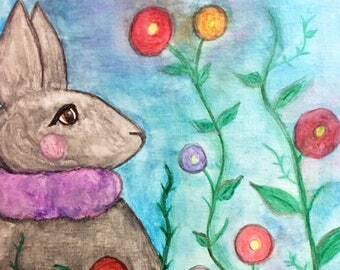 Needle felted and wool felt creations. All my pieces are unique and special in their own way. Custom orders are available. Please check my shop policies for more information. E-mail or convo me if you have any questions. Thank you for stopping by. 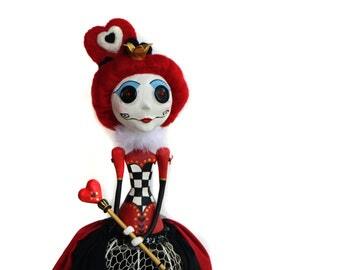 Funky, retro, goth, primitive, whimsical, spring, halloween, christmas, custom, collectible, clay, cloth, OOAK art dolls. 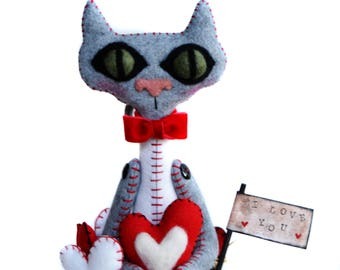 Needle felted and wool felt creations. All my pieces are unique and special in their own way. Custom orders are available. Please check my shop policies for more information. E-mail or convo me if you have any questions. Thank you for stopping by. The shipment was quick. It has arrived on time. The doll is perfect. Its details are beautiful. Lots of quality and dedication. It is a piece of art. Excellent communication with the seller. I am very happy with the purchase, I will buy again in this store. I highly recommend it. I've always been surrounded by handmade. It was a big part of my childhood and a way of life growing up. 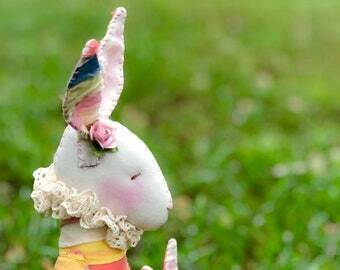 Those childhood memories inspired me to initiate the art doll making journey and start working with needle felting. I enjoy the process of each creation, the metamorphosis of each doll. I usually come up with an idea, inspired by a feeling, a cool material I found, a memory, a song, an experience in my life… As the doll evolves everything starts taking place and a little personality starts to emerge. My dolls express the way I see life. A fusion of opposites looking for equilibrium to make it work. 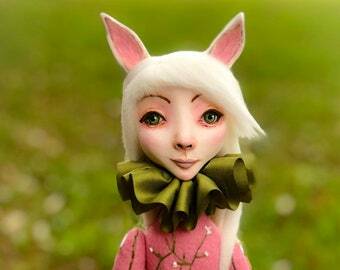 All my dolls are sculpted by hand with paperclay. No molds or patterns are used in the process. The process of creating a doll can takes days and sometimes weeks depending of the complexity of the doll. My process includes sculpting the initial base for the doll, drying, sculpting with more detail, drying, sanding and finally painting and sealing the doll. 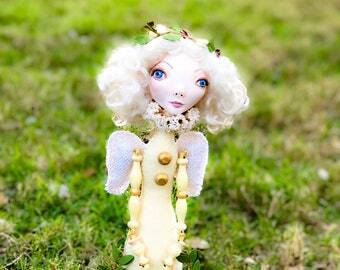 It has been very rewarding working with customers on custom art dolls. 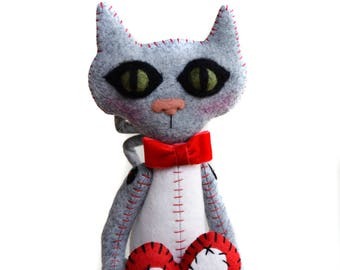 I love connecting with their imagination and being able to translate their ideas and emotions in the creation of the doll. Needle felting is another of my joys. I taught myself how to do it through reading and watching videos. Love the texture and easy manipulation you get working with wool roving! The initial creation process is pretty similar to when I’m making a doll. Basically, an idea comes to my mind and I let the needle take over. I work freehand meaning I don't trace patterns on the wool. I choose the wool roving I’m going to work with and let the needle dictate which direction I go. 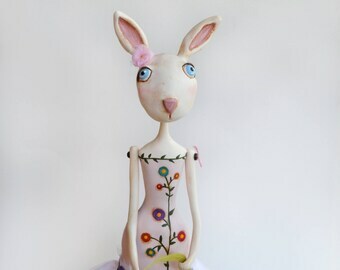 Please feel free to contact me with any questions you might have or if you would like to collaborate with me creating an art doll or a needle felted piece just for you. Thank you for reading. I hope you enjoy my creations as much as I do. Native of Colombia, South America. Lover of music, handmade, quirky finds, traveling, whimsical, gothic and steampunk art. I'm passionate about art doll making. I find it to be the best theraphy for the soul. Thank you for visiting my Etsy shop. All my work is one of a kind. I don't use patterns or molds for my pieces. I design as I go, making each piece unique. I take pride in my work and want you to be happy with your piece. If for any reason you're unhappy please contact me within the first week of receipt and we'll discuss the issue. I’ll do my best to make it right. If you purchase two or more big pieces in you order. Please be aware I will have to adjust the shipping fee if I have to mail them separately. I will notify you as soon as the order if placed. If you have a question on the shipping you can contact me directly. Pieces valued at $50 or more are insured. Unfortunately I don't have control over how the postal service handles packages. In case of transit damage I will ask you to provide pictures of the damage (the piece and the packaging) then return the damaged piece to me. I will have to provide the pictures to my insurance company when I file the claim. The insurance company may ask you to fill out a form with details of the damage. While inconvenient, please understand these steps are required in order for you to be refunded. Throughout the process I will keep you updated on the claim status. Note, all custom order sales are final. I accept payments through Paypal. If you don’t have an account with Paypal you can also pay with your credit without creating an account. Simply, just look on the left side of the Paypal page and you will see the Visa/Mastercard/Discover/American Express link to continue your payment with credit card. Follow the payment process and you’re ready to go. I'm also accepting credit cards through Etsy. I ship your order to the ETSY ADDRESS listed on your account. Please make sure you have a current address listed. I ship to all 50 United States using first class mail with delivery confirmation number and sometimes priority depending on the weight of the package. For international buyers, I ship first class. Note, all duties and customs fees are the responsibility of the buyer. Packages mailed international can take 3 to 4 weeks to arrive. During the holidays, it can take even longer due to customs. Please be patient and contact me if you have any questions. If you are buying more than 3 pieces at once please contact me so I can adjust your shipping rate. It could be cheaper. I'll send you an Etsy shipping notification once your piece has been shipped. I carefully wrap and package each piece to avoid damage. My shipping fee includes handling and insurance on pieces valued at $50 or more. Custom orders are available. Please check my Custom Art Dolls section to see examples of my custom work. I can e-mail you pictures throughout the process so you can provide feedback as your doll takes shape and make sure you're satisfied with the final piece. I'll then ship the doll. I require full payment in advance before I’ll start a custom order. Please convo or e-mail me with the details of your custom order, including desired delivery date. In general, it takes around 3 weeks to design a piece and complete your order, depending on the complexity of the doll. Don’t hesitate to ask all the questions you like regarding a custom piece, before you order. The better we communicate, the better able I’ll be to capture the spirit of the design you’re after. All original artwork and images copyright © 2011- 2018 Myriam Powell, MyriamPowell Designs. Copyright of my work doesn’t transfer after it has sold. Reproducing images of my art work for resale is not permitted or transferring to others with the same intent. I retain the rights to use the images of my artwork including custom artwork.